Iraq's prime minister has rejected an offer from the Kurdistan Region to "freeze" the result of last month's independence referendum and hold talks. "We won't accept anything but its cancellation and the respect of the constitution," Haider al-Abadi said. The Arab-led central government insists the vote, in which people decisively backed secession, was illegal. The Kurdish offer came after Mr Abadi ordered the Iraqi military to retake disputed territory held by the Kurds. The operation - which also involved police, special forces and the Popular Mobilisation, a paramilitary force dominated by Iranian-backed Shia militias - sparked clashes that left dozens of people dead and many more injured. On Tuesday night, the Kurdistan Regional Government (KRG) called for an immediate ceasefire to prevent further bloodshed. The KRG said it was prepared to "freeze the result of the referendum" and "start an open dialogue" with the government in Baghdad "on the basis of the constitution". 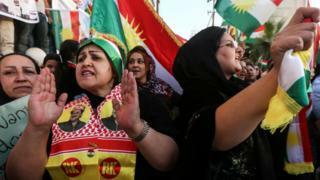 The United States, which along with most of the international community criticised the Kurdish authorities for holding the referendum, welcomed the offer. But an MP close to Mr Abadi, Ali al-Alaq, warned that agreeing to "freeze" the referendum result and not annul it would create a "time bomb" that the KRG "could throw at the central government whenever it wishes". The oil-rich areas retaken by pro-government forces since 16 October are claimed by both Baghdad and the Kurds. Kurdish Peshmerga forces moved into the areas in 2014, when Islamic State (IS) militants swept across northern Iraq and the Iraqi army collapsed. On Thursday, Iraqi pro-government forces advanced on Peshmerga positions in the Zummar area, near the Syrian border in northern Nineveh province. An Iraqi security source told the BBC that the forces shelled Peshmerga fighters who attempted to resist the advance, adding that there had been clashes in the villages of Bardiya, Mahmoudiya and Sahila. The Popular Mobilisation said its fighters were trying to take control of Fish Khabur. The town lies just inside the administrative boundary of the Kurdistan Region, but it is close to the strategically important point where the borders with Iraq, Turkey and Syria meet. An oil pipeline linking Kirkuk province to Turkey also passes through it. The Kurdistan Region Security Council condemned the "unprovoked, four-pronged assault" by Iraqi army und Popular Mobilisation units, who it said were using US-made weapons and vehicles intended for the campaign against IS. "The international community must denounce Iraq's reckless behaviour in the last two weeks. It has destabilised some of the country's safest areas, displaced over 150,000 individuals and created dangerous security vacuums," it said. Last week, Mr Abadi rejected a call from US Secretary of State Rex Tillerson to send "home" Popular Mobilisation fighters not battling IS, calling them "patriots".